And as a flood of stories over the past year have confirmed, once the foreign (mostly Chinese) bid was withdrawn, property prices started to drop. It's happening in Australia (and especially in Melbourne and Sydney), it's happening in New York, it's happening in London and - as we've catalogued over the past few quarters, it's happening in Vancouver, which for a while held the ignominious title of world's most overpriced housing market. After a chasm opened up between bids and asks in the Vancouver housing market last year, the halt in home sales has finally started filtering through to prices as reluctant sellers finally cave and cut their prices. According to data from the Real Estate Board of Greater Vancouver, the city's composite home price (which incorporates prices of houses, condominiums and townhouses) fell 4.5% in January from a year earlier to C$1.02 million ($780,000), the biggest decline since May 2013 and down about 8% from the June 2018 peak. 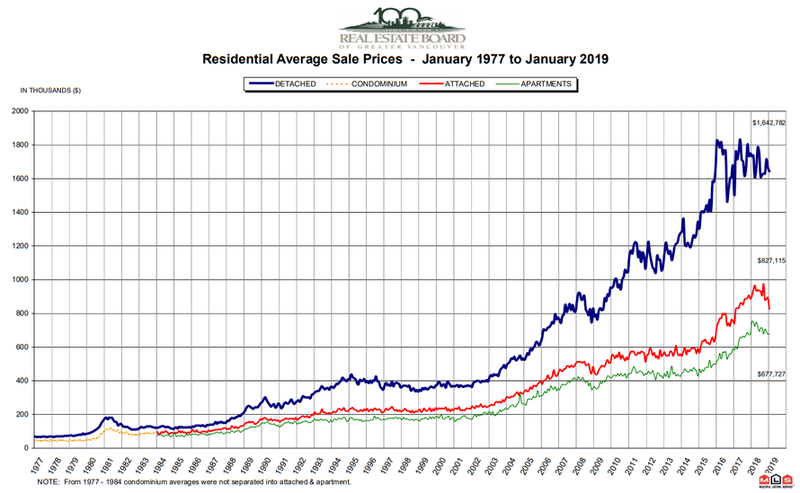 As we noted above, the drop in prices follows a decline in sales - the biggest drop in two decades - that many have attributed to new taxes, higher interest rates and a crackdown on dark money flowing into the Vancouver area real estate market. Meanwhile, outbound investment, Bloomberg confirms, has slumped. Ultimately, the Fed-led global monetary stimulus sent prices in these markets roaring to dizzying new highs during the QE era. But now that the Fed is reining in its balance sheet (and until signaling a "pause", had been raising interest rates, too) prices that rose on the back of a tidal wave of liquidity are now coming back down. "Today’s market conditions are largely the result of the mortgage stress test that the federal government imposed at the beginning of last year," Phil Moore, the realtor group’s president said in a statement Monday. The very top end of the market has been the hardest hit: Prices in tony West Vancouver have fallen 14% yoy as of January. And as one real estate agent confirmed to BBG, now that foreign buyers are pulling back, sellers who were once asking for C$12 million or C$13 million are asking for...significantly less. "These homes in West Van were selling for C$12 million, C$13 million two years ago," says Adil Dinani, a realtor with Royal LePage, a unit of Brookfield Real Estate Services Inc. "Agents are asking me to throw them off for anything - C$8 million, C$8.5 million, whatever it is." Dinani, who’s been in the business for 14 years, says there are fewer speculative investors, and foreign buyers have really pulled back. "And what local buyer has C$6 million, C$7 million to put towards a home?" he said. Still, with Vancouver's housing market extremely unaffordable when benchmarked to local wages, no local buyers have the money for these homes.